Electric Disk Grinding Mill complies with ASTM C409 for sample preparation of soil specimens. This mixer has been designed specifically for the demands of cement and soil mixing — not kitchen-prep. Mixer for mixing material samples. Includes bowl, whip, hook and beater. Heavy porcelain mortar for use with H-4258 pestle. Complies with ASTM D421. 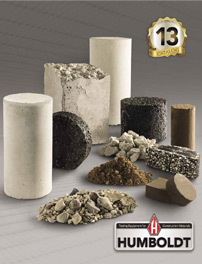 Made for gently grinding soils without breaking individual particles.